LEFT: The 4-star Luther-Hotel Wittenberg is owned by a charitable organization, the Berliner Stadtmission. My double room on the top floor was large and comfortable, with plenty of daylight from the screened windows. The furniture was modern, with lots of blond wood (which is pretty typical of German hotels in the three- and four-star categories). The lobby had plenty of space for sitting around on a rainy day. The reception staff were friendly, and hotel manager Roger Voigt (who lives on the premises) shared an interesting story: During the GDR era, when he worked as an aircraft technician, he was invited to participate in an experiment where mechanics were trained to fly on a flight simulator. He did so well that he was fired from his job, because the East German authorities were afraid that he might use an airplane to escape across the border. The Luther-Hotel is loyal to its namesake: A bust of Luther stands in the lobby, and by the time you visit Wittenberg, a newly commissioned two-meter statue of the Reformer should be greeting guests within the front entrance. During my visit, the hotel featured a "Luther Burger" on the restaurant's lunch menu. The burger is available by itself or with an order of "Käthe Nuggets" (a tuberous homage to the Reformer's bride). The Luther-Hotel Wittenberg belongs to the Albrechtshof Hotels group, which is owned by the Berliner Stadtmission. Profits from the Luther-Hotel and its sister properties are used to help the homeless, provide children's services, care for the elderly, etc. 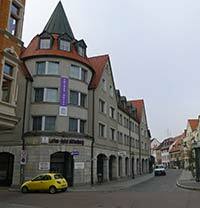 For more information about the Luther-Hotel Wittenberg, or to book a room, visit www.luther-hotel-wittenberg.de.